Staff Sgt. 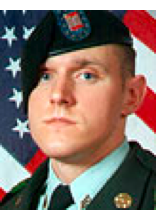 Michael L. Deason, of the 3rd Battalion, 320th Field Artillery Regiment, 3rd Brigade, 101st Airborne Division from Fort Campbell, Ky., was killed on Aug. 31, 2006, in Ad War, Iraq. A dedication ceremony honoring Staff Sgt. Michael L. Deason is scheduled for Saturday, September 3, 2011, 4:30pm.